For a few years we battled a bit of an order in the area of the holding tank. New hoses and a hefty dose of chemicals helped quite a bit. However, at the beginning of this year after a good inspection it was clear the tank was getting way past its prime. The difference with the new tank has been dramatic. 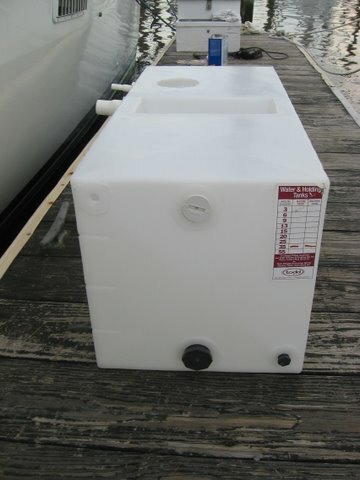 At first I looked into purchasing what is essentially a custom tank from OceanLink but I found the site very frustrating, it was expensive (I think around $250.00) and would take three weeks for delivery. I called the company and they were very nice but it was more than I wanted to spend and I needed the tank fairly soon. I ended up purchasing a 35 gallon tank from The Tank Depot which worked out pretty well. The tank was $125.00, and I needed a conversion kit that cost another $35.00 because the way the tank was configured would not work for me. Thats essentially the difference between purchasing a custom tank and what here is essentially a stock item. They have quite a selection of sizes and shapes but they come stock where the hoses fit in. So first step was to make the tank the way I needed it. You can see below where all the holes for the fittings were. The conversion kit gives you plugs for those. I will admit it was a bummer not to use those holes because they were threaded, and the holes I made for the conversion kit were not. But trying to use it as already configured would have been very hard.